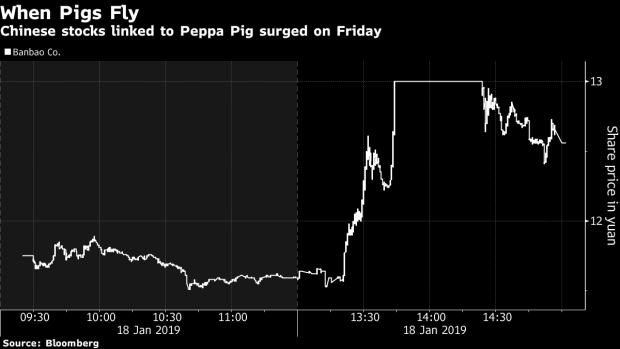 (Bloomberg) -- Chinese stocks connected to Peppa Pig surged after a promotional clip for a film featuring the cartoon character went viral. Banbao Co., which is authorized to use the Peppa Pig image on its toys, surged by the 10 percent limit, while toymaker Alpha Group Co. jumped as much as 7.3 percent. Wei Yi, an analyst with Kaiyuan Securities Co., said the gains are driven by speculators and likely to be short-lived. The movie trailer features a man discovering who Peppa Pig is and then making a gift to give his grandson for the Lunar New Year festival. The holiday begins on Feb. 5, and marks the start of the Year of the Pig.